Computer technology is being used to give a new lease of life to the electric guitar. Legendary electric instrument maker Gibson has created a guitar that you can plug into a computer and record directly on to a hard drive. 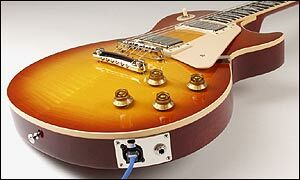 It uses what Gibson calls Magic technology to allow guitarists to apply digital effects to each string of their instrument. "It is not a synthesizer, it's not a special computer program," explained Jeffrey Vallier, a senior engineer at Gibson Labs. "We're trying to capture the real character and sound of a normal guitar but give you more control and ability to express yourself." The team at Gibson Labs spent the past three years turning the Magic technology behind the digital guitar into reality. The instrument has an Ethernet connection like those found in the back of computers, using a standard network cable connection. "What we've done is to make it very high quality and very fast," Mr Vallier told BBC News Online, "and we have optimised the Ethernet so that you can use it for music and real studio situations." Gibson says this will eliminate any noise distortion associated with traditional analogue wires by sending a high-quality digital signal directly from the guitar to the mixing desk in a recording studio. With the Magic technology, the sound from each string is captured individually, so a guitarist can put a special effect on just one or two of the strings. "The difference between a digital guitar and a normal guitar is that we are adding control functions to the normal guitar that you don't have," explained Mr Vallier. "You can send each string on a separate sound channel and you can do all kinds of modifications on that sound individually to make it big or full, something which you cannot get with current guitar technology." The digital technology should add between $200-300 to the usual price tag of an electric guitar. But Gibson could face a hard time convincing guitar diehards to adopt the innovative product. Many of today's guitar bands seem more interested in recreating the sounds of Led Zeppelin or The Ramones. Mr Vallier recognises that some guitarists will be wary of abandoning their traditional instruments. But he stresses that some musicians would be tempted by the new possibilities on offer. "They will be excited by the ability to set up a really nice broad sound in live situations and use the knobs on your guitar to control the lighting systems or other special effects in real-time," he said. In any case, he believes that the move towards digital instruments is irreversible. "It is very much the future," he said. "It opens a new page in what you can do with guitars, expanding the creativity and expressiveness for musicians anywhere." The first Gibson guitar with Magic technology is expected to be a Les Paul model, which is due to be released within the next six months. You can hear more about Gibson's digital guitar on the BBC programme Go Digital.